EASTON, PA – How many cigars have you smoked that were inspired by the lyrics of a song? If you've smoked some of the selections from Crowned Heads Cigars, chances are you already have. 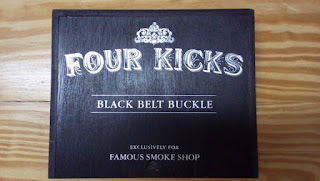 Now, Famous Smoke Shop, the leading online distributor of discounted premium cigars, specializing in offering the web’s widest selection of cigars at the lowest prices, is introducing a new exclusive edition from Crowned Heads: "Black Belt Buckle" cigars – the first-ever line extension to the bestselling Four Kicks cigars edition. 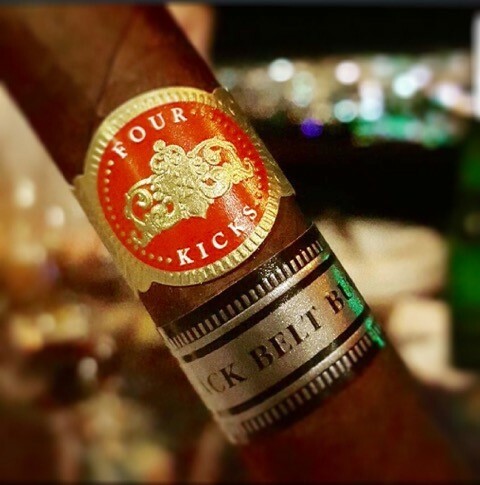 "Black Belt Buckle" cigars have the same Nicaraguan long filler & binder tobaccos found in the original Four Kicks blend (rated an "Outstanding" '91' by Cigar Aficionado), finished in a rich-tasting Connecticut Broadleaf maduro wrapper. The result is a medium-bodied smoke that exhibits the balance, complexity, and "Cubanesque" flavor profile of the original Four Kicks Habano wrapper recipe, augmented by the sweeter nuances found in prime Connecticut Broadleaf. "Having the opportunity to play upon the original binder-filler with a Connecticut Broadleaf wrapper has always been in the back of my mind, and soon, it will be a tangible product that will be enjoyed by cigar enthusiasts around the globe," said Crowned Heads Cigars president, Jon Huber. The cigars will have an across-the-board MSRP of $7.96/cigar, and are expected to arrive in-store on December 3, with preorder sales starting Thursday, November 19. Oh, about those song lyrics that provided the inspiration for the name. . .
And the red man's fire in his eyes. “The Four Kicks brand will always hold a very special place in my heart, as it was the first release under the Crowned Heads umbrella," added Mr. Huber. "We're also very excited to be able to team up with Famous Smoke Shop and bring Four Kicks 'Black Belt Buckle' to the marketplace." More information may be found by clicking here.